Mary Neill was the second child born to Robert and Mary Neill in Tandragee. The year was 1838. She married William Davison (born Tandragee 1830) at St Marks Church, Tandragee on 15 January 1858. The couple lived in Tandragee for 4 years and had three children but then decided to emigrate to New Zealand. They sailed on the 'Mersey' of 812 tons and arrived in Auckland, New Zealand on 11 June 1861. During the voyage Margaret, their youngest child died and was buried at sea. 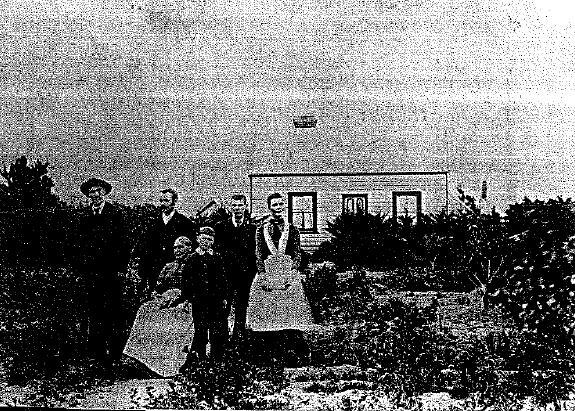 They initially lived in Cornwall Street in Christchurch but then settled in Templeton south of Christchurch where they brought up their family. The Davisons kept horses at Weedons and Mary's neice, Maggie from Westport, was a frequent visitor and learned to ride there. Sarah Anne b. 15 Feb 1859 at Tandragee, Ireland. d. 4 Jan 1901 at Sydney, Australia. Buried 6 Jan 1901 at Rookwood Cemetary. Margaret b. 14 Mar 1861, Tandragee, Ireland. d. At Sea aboard the 'Mersey' enroute to New Zealand. Buried at sea. John Alexander b. 27 Oct 1863, Christchurch, d. 6 Oct 1943 and is buried at Addington Cemetary. Edward b. 19 Apr 1865, Christchurch, d. 9 Aug 1934 at Sunnyside Hospital, Christchurch. Buried on 11 Aug 1934 at Templeton cemetary. Thomas b. 19 Sept 1866, Christchurch. d. 21 May 1949 at Fendalton, Christchurch. Buried 24 May at Springston Cemetary. William James b. 1869, Christchurch. d. 9 May 1920 at Sunnyside Hospital, Christchurch. Buried on 11 May 1920 at Templeton Cemetary.